When it comes to early twentieth century modernism, Edward Franklin Fisk (1886 -1944) is something of an odd man out. 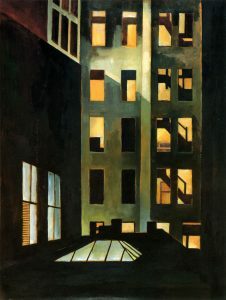 Although his art was championed and exhibited by several New York galleries, his reputation never attained the mixture of glamour and spirituality enjoyed by his close friends Charles Demuth, Stuart Davis, and Eugene O’Neill. Born in New York City, Fisk studied in Paris, where he joined in the soirees at Gertrude Stein’s apartment, and later he was an active participant among the intellectual circles of Greenwich Village and Provincetown. Having absorbed avant-garde styles and ideas, he moved in 1926 to Lexington where he taught at the University of Kentucky, raised a family, and struggled to maintain his artistic integrity in a setting far from the front lines of American modernism. The bulk of Fisk’s extant works are oil paintings — gently abstracted, often intensely colored — that present the farms and towns of Kentucky and Vermont in a style that balances the influences of European expressionism with American realism. Devoted to red, blue, and green, Fisk developed a formalist rigor that emphasized the flatness and frontality of his subjects, whether an isolated tree beside the side of a house, a tabletop assortment of vases, flowers, and fruits, or a portrait of a model in his studio. When he was in his late 40’s, Fisk took on the printmaking media and mastered the difficult processes of etching and mezzotint, producing prints which are impressive for their range of tone and intimate subject matter. Edward Fisk was born on October 17, 1886, in New York City to Edward Franklin Fisk (1858-1917) a map engraver in the family-run Fisk & Company, and Sarah (Sadie) B. Robarts Fisk (1866-1942)1 He was the oldest of four children: Helen (born 1889), Arthur (born 1891), and Dorothy (born 1893). During the 1890s the Fisk family is believed to have resided in Brooklyn although, around the turn of the century, they moved to Ridgefield Park, New Jersey. In 1907, the family moved back to New York City and took up residence at 213 West 106th Street. The fore-noon had been this and that. The afternoon dragged through an exhibition or two, a saloon or two, –some art talk. Then, somehow, tired and discouraged, we found ourselves at Fisk’s suggestion, in a place, a gallery, that, I like the word place better than the word gallery, for this place. It was brought into the room. Source: Rachael Sadinsky, “Edward Fisk: A Modern Life,” from Edward Fisk: American Modernist (Lexington: University of Kentucky Art Museum, 1998). Exhibition catalogue available from the Museum. 1. There is some ambiguity about Fisk’s year of birth. 1888 is the birth year listed on employee records maintained in the University of Kentucky Archives and Fisk’s faculty/staff biographical file; it is also the birth year listed on Fisk’s death certificate. However, Fisk’s personnel card, issued by the University of Kentucky, lists 1887 as the birth year. And 1886 is the birth year in the artist’s listings in Who’s Who in American Art, published during his lifetime. Family archives have photos dated 1891 of “Ted” at age 5-1/2 and a drawing dated ‘96 and inscribed “Thomas Robarts / Drawing by Ted / I0 years old,” indicating a birth year of 1886, although the drawing, the date, and the inscription are in different hands. According to his descendants, Fisk was born in Brooklyn, a birth location circumstantially confirmed by location of photographers who made early cabinet pictures of Fisk children. However, searches in Brooklyn and Manhattan borough records for a birth certificate for the years 1886, 1887, and I888 were inconclusive. 2. Fisk’s studies at the Art Students League and the National Academy of Design are confirmed by the schools’ records. His years with Henri however, remain unconfirmed. The artist himself made reference to Henri’s studio on his resume, in his University of Kentucky faculty/staff biographical file and included in other biographical records. 4. Stuart Davis (New York: American Artists Group, 1945) [p. 4]; reprinted in Patricia Hills, Stuart Davis (Abrams/NMAA, 1996), p. 26. 5. Henri, The Art Spirit, p. 224. 6. Edward Fisk journal, p.22 (p. 17 transcription). The Fisk journal is preserved in the Fisk family archives. It is a loose, disjointed series of reminiscences, thinly veiled fictionalized accounts of his past, teaching points for class and drafts of letters to friends. A microfiche copy of journal excerpts is in the Archives of American Art, Washington, D.C.
7. Othon Friesz, quoted in Jean-Louis Ferrier, The Fauves: The Rein of Colour (Paris: Editions Pierre Terrail, I992), p. 162. 8. According to Emily Farnham, Fisk first met Demuth in Paris. See Charles Demuth (Univ. of OK, I97 I), p. 72. Milton Fisk, the artist’s son, owns a watercolor portrait by Demuth of Edward Fisk reclining on couch, inscribed bottom left: E.F. Fisk / C. Demuth / Paris 1912. 8. Hartley was in Paris from mid-April 1912 through April 1913. He was in Berlin through November I9 13, when he returned to New York City. He traveled back to Germany in March I9 14. See Barbara Haskell, Marsden Hart/ey (NY Whitney Museum, 1980) and Gail R. Scott, Marsden Hartley (NY Abbeville Press, 1988). 9. Letter from Edward Fisk written circa 1931 to his sister-in-law Spalding Young, a professor of English at Maryville College, St. Louis, MO. Edward Fisk papers, Fisk family archives. 10. Charles Demuth, “Between Four and Five,” in Alfred Stieglitz’s Camera kt&& No. XLVII (July I914k. 11. Marsden Hartley, “291-And the Brass Bowl,” in Waldo Frank, Lewis Mumford, Dorothy Norman, Paul Rosenfeld, and Harold Rugg, America &Alfred Stieglitz (NY Literary Guild, 1934) pp. 236-42, excerpt p. 239. Hartley’s essay, published in 1934, describes the New York milieu of twenty to twenty-five years prior: “We began to hear names like Matisse, Picasso, Cezanne, Rousseau, and it was from all this fresh influx that I personally was to receive new ideas and new education. Stieglitz recalled to me my pointing to a Picasso abstraction and saying, this is the way it will go from now on, only an instinctive reaction certainly.” Hartley goes on to note that the artist’s signature is irrelevant: “. If there is any personal quality, that in itself will be signature enough, and we have seen a sequence of unsigned pictures permeated with an almost violent purity of spirit” (p. 240). Fisk may have shared Hartley’s disdain for the signature: the bulk of his extant paintings are unsigned. 12. Rebecca Zurier, Art for the Masses: A Radical Magazine and Its Graphics, 191 I- 1917 (Philadelphia: Temple University Press, 1988) p. 35.